That One Time… I Met My Favourite Band – redleafgoldteeth. “That One Time” is another new exciting RLGT series that we will be introducing regularly, mid-week. Similar to our “story-time” segment, “That One Time” will detail specific moments in our life, whether they be important landmarks, or just random, hilarious stories. Check out this new series every week, and share your own similar stories in the comment section, or share our stories if you find yourself entertained! Everybody has that one (sometimes more than one) creative influence, often times musicians or artists, who just tap in to everything that equates to joy and hope for that particular person. Now as mentioned this can be a musician, an artist (visual or other), an athlete, or even just that one family member that always has the right thing to say. For me this creative influence would be one particular artist (not too hard to guess I bet), and his band. Yes, for anybody who has met me for even 5 minutes, you were right. These people go by the name of Chance the Rapper & the Social Experiment (SoX). Though I am yet to personally meet Chance, this story is about that one time I ran into, well literally walked into, the SoX. For those of you unfamiliar with the SoX, they are a band comprised of 5 members, with alternating lead members. Often fronted by either Chance the Rapper, or Donnie Trumpet, the rest of the SoX is comprised of keyboardist Peter Cottontale, producer Nate Fox, and drummer Greg “Stix” Landfair Jr., all of Chicago roots with the exception of Cottontale. They have all been creating music for quite a while, with a few of them hailing from Kids These Days fame. If none of that sounds familiar, you might have heard a little something about their latest drop, a little, free-release project called SURF? You know, that one that shook up the entire industry earlier this year, and featured some of the biggest names in music from J. Cole to Busta Rhymes to Miss. Erykah Badu? The one that almost featured Kanye West as a narrator? Yea that one. If somehow you are still unsure of what I’m talking about, go check it out here then come back to this article to help fully understand my excitement. Anyhow, this brief story takes place about 2 weeks ago during one of the best weekends of my life, the 2015 Squamish Valley Music Fest just outside of Vancouver. It was the very first night of real music (there was a small night of openers the night before that I didn’t attend), and more than half of the 20+ people who made the trek down with me were ready to go take in the Chance the Rapper/ SoX show within the hour, which happened to overlap another headliner, Sam Smith, where the rest of our group headed (sus). A couple of us decided to make our way back to the campsite after ScHoolboy Q to have a couple more drinks instead of bearing the ridiculously priced drinks inside the show, before making our way to the venue. During the walk back, taking in all of the sights as if I had never seem them before, I gazed upon a jiggy looking afro, and thought to myself “wait, theres no other black people here” (jokes), and continued to peep until the face of Peter Cottontale turned back to face me. Somewhere between to happy to think twice and too drunk to care, I stumbled up and named each one of the 4, 1 by 1 (think I might have forgotten Nate’s name, my bad), and proceeded said something idiotic like “OMG, YOU’RE THE SOCIAL EXPERIMENT!”. Long story short the guys were super cool about everything and let my fang-girling self take a picture with them, and I might have even helped Stix find some some extra-curriculars, while they let me walk around with them for about 2 minutes. At the end I dapped them up, said thank you for everything, and pussyed out on the chance to drop some details about my website, before running back to my friends to tell them the news. Waiting for me right behind the “Stawamus” stage like we previously planned, the group of 10 or so took in the picture I had just gotten while bombarding me with questions. Feeling on top of the world we trekked out way all the way to the 2nd or 3rd row and hour before seeing one of the greatest concerts of my life (only behind my first time seeing Chance, and Kid Cudi the previous year. This was also before Drake brought the house down the following night, but more on that another week). The show was amazing as planned, and my friends and I sang along with every damn word that we knew, even showing off when Chance performed his “new” song, “Paradise”. I even lost my real prescription glasses while tossing up the double bird, yelling “f*ck” something or other along with one of the opening songs. Worth it. Just to get an idea of how close I was… Second row and I still managed to get someones head in my way. The end of the show came too soon, and we were left waiting outside hoping a miracle would happen and we would find our way back stage to party with out favourite band. It didn’t. But I got a hell of a story to tell anyways, and I feel like this story is only half way there. Give me a year. And that was the story of that one time that I met my favourite band. haha I’m happy for you! Meeting someone you look up to so much is the best feeling in the world! Thank you! Hahah it really was so great to be standing there with some people who inspired me so much. Wish everyone could get to experience that feeling at least once in their life! Luckily I was able to see one of my favorite artists in concert really close up which was such an enlightening experience! Pingback: Fan Of A Fan: The End Of Fandom Boundaries | redleafgoldteeth. 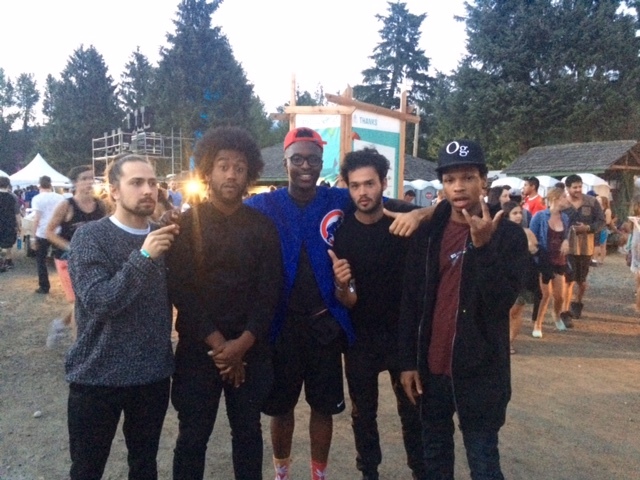 Pingback: That One Time… I Traveled 15 Hours To Sneak Into A Chance The Rapper Concert – redleafgoldteeth.